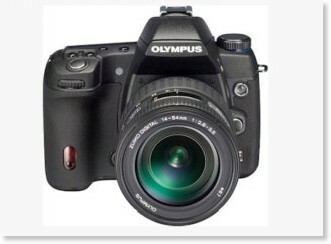 September 22, 2008: Olympus will exhibit a concept mock-up of a new interchangeable-lens type digital camera based on the Micro Four Thirds standard at Photokina, which opens in Cologne, Germany, tomorrow. Few details are currently available on the as-yet unnamed DSLR, which is to be shown in prototype form at the Photokina tradeshow and can also be seen in the press image at the end of this news item. What we do currently know is that the new camera is billed as a “mid-level” (advanced amateur) model that will sit between the company’s E-520 and E-3 models in the lineup. It is set to inherit the 11-point autofocus system, in-body image stabilization, and 1/8000 second top shutter speed capabilities from the Olympus E-3, and will also include an articulating LCD display (although we don’t currently know if that display will have the same spec as the E-3’s articulating LCD). Today, Olympus has announced the development of its first Micro Four Thirds product, which is being shown as a concept camera during the Photokina tradeshow. Partner company Matsushita is set to begin shipping its first Micro Four Thirds product – the Panasonic G1 – from mid-November 2008. While the G1 does better existing single-lens reflex digital cameras with its 4.9 x 3.3 x 1.8″ (124 x 84 x 45mm) body, the unnamed Olympus Micro Four Thirds design makes its Panasonic sibling look almost bulky compared to a body size of just 4.7 x 2.5 x 1.2″ (119 x 64 x 31mm). By way of comparison, that’s somewhere less than half the volume of the current smallest digital SLRs, Olympus’ own E-410 and E-420.